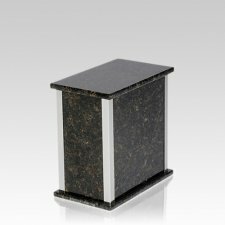 The Designer Silver Verde Granite Medium Urn in medium is crafted from Verde Esmeralda granite. This wonderful natural stone urn will create a dignified resting place for eternity to come. "The statue I received is a pure piece of art, it has been put on the cemetery headstone; even the funeral and cemetery people said it is just beautiful. My whole family loved the statue you made for us."